1) Allow your skillet to heat up over medium heat for 3-4 minutes. 2) Add 1 tablespoon toasted sesame oil to the pan, let it warm for 30 seconds. 3) Add chopped onion to the pan and saute until translucent, about 4 minutes. 4) Add 1lb. ground chicken thighs, 2 tablespoons of coconut aminos (or soy sauce), 1 tablespoon fresh grated ginger, and 2 cloves fresh minced garlic to the pan and cook until chicken is no longer pink, about 10 minutes. 5) Once chicken is done, turn off the heat and add your veggies: shredded carrots, purple cabbage, coleslaw mix. Stir everything together. 6) Serve in bowls on top of more veggies and sprinkle on chopped green onion. 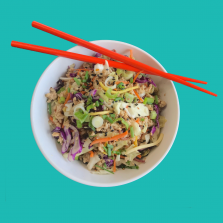 Optional: add cooked brown rice to your bowl for some whole grain goodness & sprinkle on some toasted sesame seeds.